I visited Amicus Green Building Center with my friend, Liz last week. It is a design center and home improvement store in Kensington, MD offering products screened for health and environmental integrity. 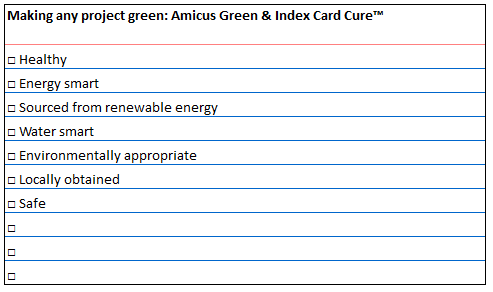 The word, “amicus,” meaning friend in Latin, embodies what the Center represents and strives for– products, principles, and practices that are friendly to consumers, their buildings and wallets and our future and planet. Amicus’ mission is to help people live, work, play and pray in sustainable, comfortable, healthy, affordable and responsible buildings. Water smart: only 1% of the planet’s H2O is drinkable. So use it wisely, protect it and keep it clean. Environmentally appropriate: the materials used won’t endanger forests (that give us the oxygen we breathe), bodies of water, biodiversity (animals and plants), land and soils—all of which our economies and societies must have to thrive. Think local: buy products that are made in the USA—and especially within 500 miles—to foster jobs, a stronger economy, and reduce transportation footprints. Safe: not just that the building won’t burn, fall down, or poison you, but that the resources used don’t connect us to our enemies or corrupt rulers. July 28, 2014 in Environment.